The kitchen sink drain has always been a bit slow, but for the past couple of months it has been exceptionally slow. Finally today it stopped draining all together. We put it on our list of things to take care of and went out for a walk to take advantage of the gorgeous weather. 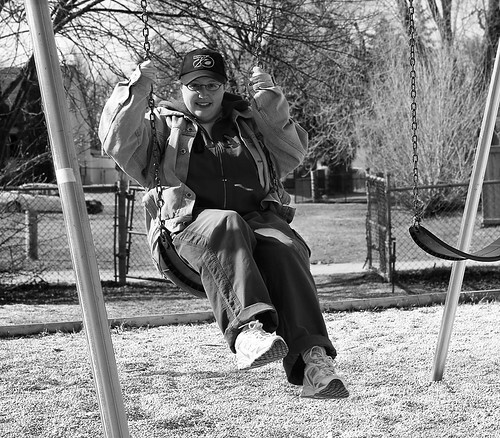 We grabbed breakfast while we were out, and I captured this shot of atara playing on the swings on our way back home. I don't know who these swings are designed for, but they are obviously meant for people with legs much longer than ours. Anyway, the sink. We tried plunging it, but that just made it angry. Before the plunging it worked at a very slight trickle; after, it stopped draining almost entirely. Time for the big guns. I drove up to Canadian Tire and picked up a couple of different drain cleaning agents. The first was one of those cans of compressed evil that you shove into the drain and it (in theory) blasts out the clog. It just made the clog angrier still. I considered dumping the entire bottle of Liquid Plumber into the drain, but given the age of the pipes in this house, I decided to bite the bullet and call in a professional. He ran a snake from just past the trap in the kitchen to the main stack in the basement. After a couple of passes, we filled the sink with water and let it drain. Immediately we had a waterfall in the laundry room. Apparently the snake not only cleared the blockage, but it punched holes in the metal pipe in several places. Before he left, the cleaner arranged for an actual plumber to come out on Monday. After he left, atara and I spent the next couple of hours tearing the ceiling out of the laundry room. I am very, very concerned at this point. I have a feeling we are going to have to tear the ceiling out of the basement bathroom as well - if the plumber can even fix the problem. There are electrical wires running over and under the drain pipe. I doubt it is up to code, and he may even refuse to work on it. We may need to have the house re-wired before we can get the kitchen drain fixed. Something tells me this plugged drain is going to end up being very expensive.